Now that I am just a few years shy of 30, I realized how much of a loaded question is it to ask high school seniors what they want to do for a career. Growing up, you may be interested in a wide variety of careers. You may have no idea what you want to do at 18 when you head off to college. Or, you can decide you want to be an engineer or a lawyer only to find out you’re ready to switch career fields after a few years. It’s perfectly normal to change jobs or even decide to switch your career field. Plus, your 30s is certainly not too late to switch things up as you may want to earn more money or pursue different interests. If you’re looking to make a major job switch, here are some tips to help you start a new career in your 30s. Start by getting honest about why you want to make a career switch in the first place. Identifying your why can help you narrow down a new career field that you’ll truly be able to grow in and stick with long-term. Are you currently burnt out at work? Do the projects you’re working on no longer make you fulfilled? Have you been playing around with the idea of trying out a new job field? Some of your reasons may be financial as well. Maybe you’ve hit a ceiling in terms of salary and promotions in your current field. Or, you’re looking to do more challenging work that pays well so you can have a better work-life balance. Whatever your reasons are, get clear on them before moving forward. List out all the skills and credentials you have along with any career interests to get a feel for what jobs you might enjoy. Sometimes, your career switch can be more of a pivot while other times, it can be a complete overhaul. For example, when I worked on the content development team for a web design company, some of my coworkers expressed an interest in programming and coding websites. One coworker made the switch to pursue a programming career vs. writing content for websites which was more of a pivot because it was in the same industry. If you’ve been in the banking industry for years but want to go into event planning, that can require a lot more planning and development. For starters, you’ll need to work on gaining more skills and experience to succeed in that field. Go over your resume with a fine-tooth comb and make changes to accommodate your new career decision. 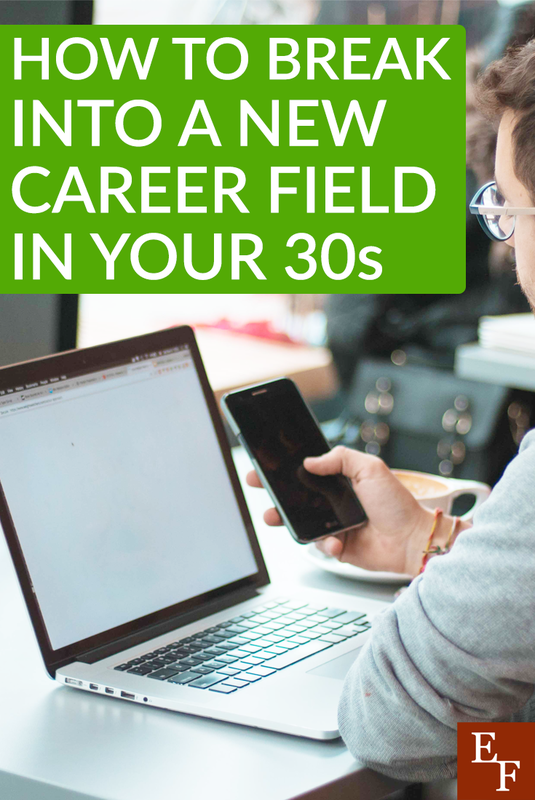 When you’re trying to start a new career in your 30s, it’s likely that you already have quite a bit of work experience and you don’t have to throw all of that away. See if you can pick the roles and job responsibilities that will be relevant to your new career field. Get clear on your objective so employers know what you’re looking for and you may even want to gather references as well. If you’re trying to break into an entirely different career field, you may have to start from scratch. In order to find work, you may have to start developing some relevant work samples or experience to help you qualify for jobs. As someone who’s been a writer for several years, I know how hard it is to get into this field without work samples. Luckily, samples are usually more important than educational background (for freelance writers) so I encourage people to start publishing high-quality articles online to build a strong portfolio. It’s the same thing if you’re looking to start designing websites, working as a photographer, video editor, marketing or PR specialist. Will you need to go back to school in order to start a new career in your 30s? If so, you’ll need to budget for that and plan accordingly. Some career fields do require you to have a certain level of education so be sure to factor that into your decision. You may need to go back to school or pay for online courses or technical training. If you’re going into a new field, it’s not likely that your current job will help fund your education, so you’ll want to look into grants, financial aid, or cut some of your expenses in order to cashflow your education. As a last resort, you can consider student loans but I’d recommend only taking out what you need and having a clear plan to pay them off as soon as you get out of school. If you’re not sure how much you’ll be earning in your new career field or how the market is, it’s probably not wise to take out student loans. As you switch careers, realize the transition may not be so smooth. You may be out of work for some time or you may need to budget for additional education or certifications. It’s best to maintain your income at your current job for as long as you can until you’re ready to make the official switch. You should also start saving up extra money in advance to add more cushion to your emergency fund. Another option would be to pick up a flexible side hustle to help you make extra money during the transition. You could even use Hulu to help save money on cable. Networking is important for any profession but it’s crucial if you’re looking to break into a new career field. You never know who in your network will have leads or ideas for you. Consider going to a few Meetups to connect with people who may be currently working or hiring in your field. You may even be able to find a mentor this way. You can also go to local industry events or job fairs to connect with more people one on one. Starting a new career in your 30s is not as uncommon as may seem to be. It’s totally doable with these tips whether you’re pivoting or completely starting over. Have you ever thought about changing career fields?